Pedal to the metal? This one takes you straight there. It barks and it bites. Easy battery access. Instant rock and metal sounds. Not really suitable for all music genres. 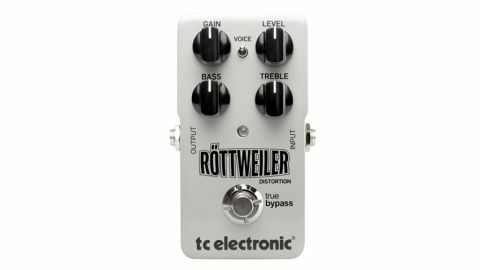 With soft clipping circuitry to recreate the sound of high-gain valve amps, the Röttweiler is aimed at metal and hard rock players and is specifically designed with a tonal balance to cut through the mix. "The range of gain here runs from 'plenty' to 'shedloads'"
The two very distinct and different voices centre on the amount of midrange available - one having a scooped sound for the more suitable for modern metal genres. If it's gain you're looking for it's all here - the range here runs from 'plenty' to 'shedloads' catering for chugging rhythms, taut riffing or lead breaks. This pedal will project your sound even without using the widely adjustable treble and bass.